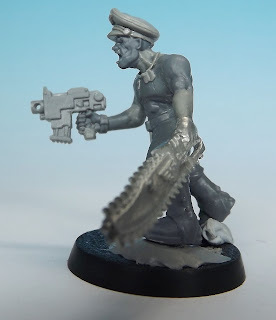 One of the things I want to try to do with this =I=munda stuff is make models that look like they fit the dark 40k universe. The imperium of man isn’t a shinny, hi-tech future utopia, however, sometimes my miniatures can look like that’s where they come from. 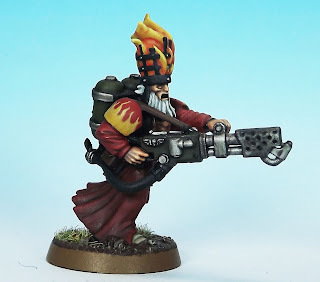 It's in part because I see, and want for my own, the ‘eavy Metal models painted with hyper-fine edge highlights and perfectly shaded block colours (understandably so, as this is the best way to show off new miniatures and generate sales). And because I am drawn to the mighty heroes – and villains – of the universe who are often best represented by clean lines and shining amour. 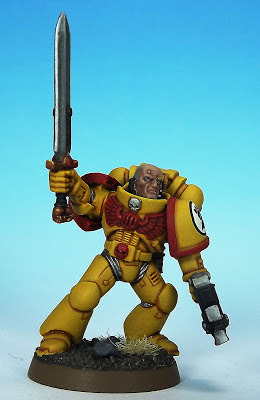 My Imperial Fists are a good example of this. The next few miniatures that I plan to make will be loosely linked with the idea of ‘fallen paragons’. These will be heroic 40k archetypes who are slowly sinking beneath the mire of the grim darkness. 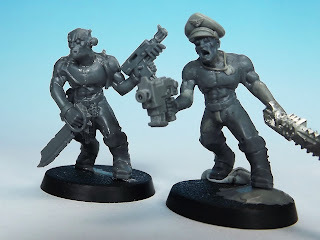 Dirty, grimey, a little mad and no longer conventional codex heroes. This commissar is the first in the series. He has been attached to a feral world regiment and has begun to go “native”. The only things that still mark him as a commissar are his cap and some dog tags. I plan on using the same painting techniques that I used on Klein and the Penitent and tattoos to show his emerging feral side. We'll see how it turns out. The hat and dogtags are sculpted from Procreate and the chainsword is from the GW commissar with plasma pistol. I've also plans for an ancient Imperial Governor torn from his palace and thoroughly confused by the process, a feudal knight turned galactic mercenary and a broken-down space marine. These ideas are still developing. 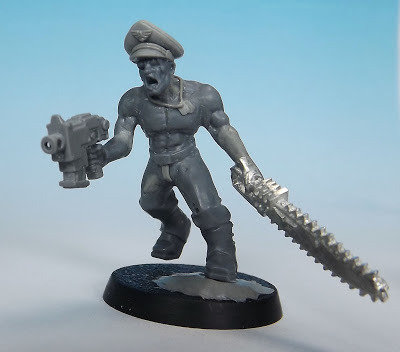 Love the commissar! 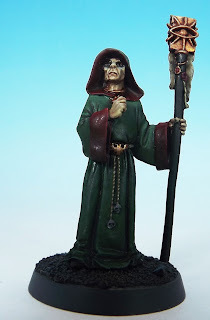 How are you planning on painting the eyes, as they are somewhat bulging?